Biennial or short-lived perennial herb from taproots and often from sprawling, nodally-rooting branches; forming clumps to 40 cm across; stems decumbent to erect, stiff-hairy and glandular to glandular-hairy, 5-40 cm tall/long. 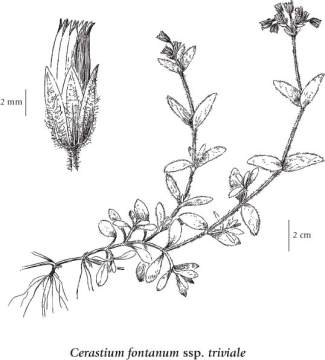 Basal leaves lacking; stem leaves opposite, oblanceolate or spoon-shaped, 7-25 mm long and 2-10 mm wide, 1-nerved, coarsely hairy; leaves of the flowering stems larger, up to 4 cm long and 15 mm wide; stipules lacking. Inflorescence several to many in an open cluster; flower stalks generally stiff-hairy; petals 5, white, 2-cleft, 5-7 mm long; sepals 5, 4-7 mm long, stiff-hairy, papery-margined. Capsules cylindric, 7-10 mm long, 10-valved; seeds 0.6-0.8 mm long, reddish-brown. Mesic to dry roadsides, waste places, gardens and fields in the lowland, steppe and lower montane zones; common in all but NC and NE BC; introduced from Eurasia.